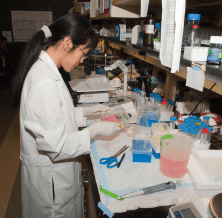 The graduate program in the Center for Molecular Medicine and Genetics accepts exceptional and motivated students seeking advanced education in Molecular Medicine and Genetics. Our graduate program offerings consist of the MS, PhD, and MD-PhD degree in Molecular Genetics and Genomics and the MS degree in Genetic Counseling. You can learn more about the each program and its application process using the links within each program. Visit the following links to learn more about our current and past students, and the students that participated in our Summer Undergraduate Research Program.